I also have a ThinkPad Compact USB Keyboard (FRU 03X8715) that I use with this laptop while docked. The USB keyboard respects the speed settings. No idea where "Evaluation Copy" comes from; I'm using the drivers that came with the Win10 install. Not sure if it matters but I have the TouchPad disabled in the BIOS. What causes this and/or how can I fix it? Last edited by Cookie Guru on Sun Nov 18, 2018 11:08 pm, edited 2 times in total. 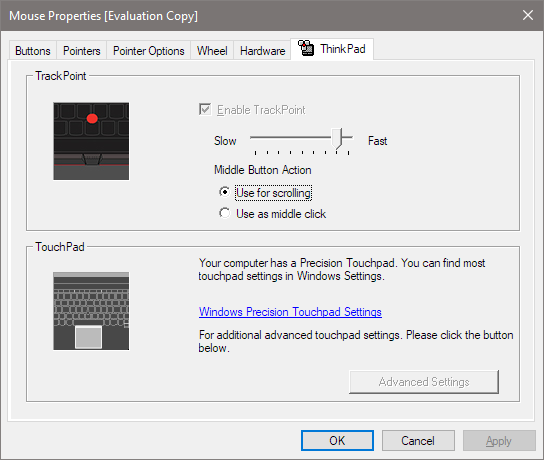 I haven't tried disabling the touchpad on the Thinkpad 25, because I actually like it. You can try re-enabling it to see if it has any effect (shouldn't, but perhaps there is a bug in the software). Also, try to rule out physical problems with the touchpad. Is the cap fully/correctly attached? Is it intact? I started experiencing problems (sluggish trackpoint movement) after using the TP25 for a few months, and it turned out that the trackpoint cap got ripped on one side, so it was not making good contact with the actual joystick underneath. You could try Linux from a USB drive to see if it an OS or hardware problem. The OP said he is using Win10 on his T25-Retro (circa 2017), and has excruciatingly slow TrackPoint, despite cranking up the TrackPoint mouse speed to fastest. I also had such a problem on my X1 Carbon Generation 4 (circa 2016), again excruciatingly slow TrackPoint, despite cranking up the TrackPoint mouse speed to fastest (for both Win7 64-bit and Win10 64-bit). ThinkPad may have used a new supplier for the TrackPoint red rubber tip for my X1C4; its red rubber tip was far too soft, and actually became seriously deformed over my 2 years of use (abuse). In the end, the TrackPoint was hammered flat (no dimples, top crown shape was flattened to a flat pancake shape). This "too soft" rubber tip also seriously slowed down my TrackPoint speed, I believe. Even ThinkPad service department commented that my TrackPoint red tip looked "different". Anyways, I recently switched to another new TrackPoint red tip with a noticeably harder rubber texture (but normal texture), and lo and behold, the TrackPoint speed was up to the normal snappy/fast speed that I've been accustomed to for the past 20+ years. I love my TrackPoint on my X1C4 now! ymmv. Linux live CD was a great suggestion. I booted in there and set the sensitivity to a reasonable value and all worked great, so clearly this was a driver issue in Windows. Blocking driver installation is possible: Control Panel > System > Advanced system settings > Hardware tab > Device Installation Settings, but that will disable driver installs for all hardware which is probably not advisable for most situations. But there is Stop Windows from installing drivers for specific devices. Yep. On my T61 Windows 10 did its routine update (shat itself a few times and required a few hard reboots) finally got its crappy updates installed and REMOVED my trackpoint driver. So expect Windows 10 updates to occasionally screw over your trackpoint driver (among other things). I may have spoke too soon. Actually back to square one after reinstalling drivers. Any suggestions? Did anyone figure out what driver we can install in Windows to get back the sensitivity setting? This is driving me insane.